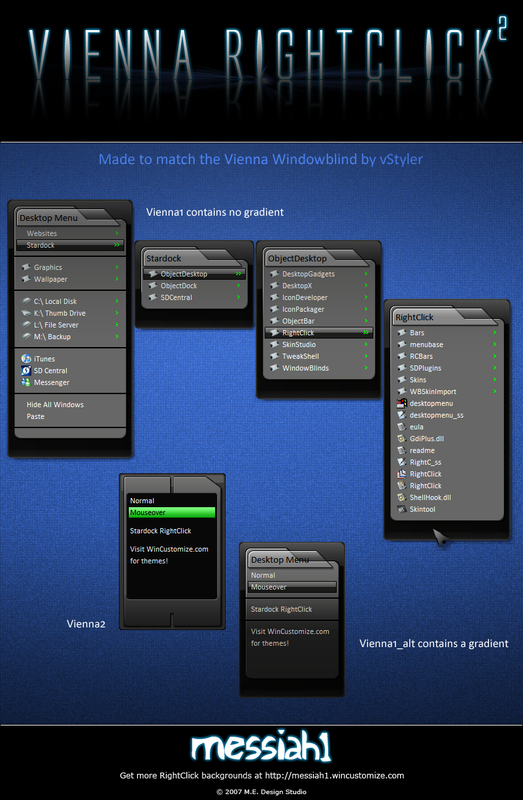 Made for vStylers Vienna WindowBlind. Please read the included readme.txt file. Report any bugs you encounter so I can fix them. Thanks and enjoy. Permission included. Very very nice, I love it. Well done. Messiah, I reported the bugs previously, apart from changing the name the bugs still exist. I dont use icons on my menues, so some menu items run off the gray area and into the black, also the mouseover doesnt cover the whole text. You need to change the tightitem width buffer from 2 to 10 to correct this. Also, what has happened to the gradient that you had in the previous version, I thought that looked better. buzzh58, I liked the gradient also, but on a menu that only had two or three things, the gradient looks all out of whack. Next update, I'll put two in, one with gradient, one without. Is the tightitemwidthbuffer the only thing that's wrong? Is the tightitemwidthbuffer the only thing that's wrong? Thats the only thing you can fix Messiah, having titles though is always a problem and there's not much you can do to fix those. Everyones menus are set up different so you cannot adjust to cater to all needs but having the tightitem buffer margin set right is a must. Its always going to be different depending on how they set up their menu.. I was curious to the size of the file...the normal RC is 15 to 25 kbs. But the screen shot you added was a png and the 2 fonts were 500kbs..I just deleted them before I extracted file. Before when you had same file name as my vienna RC I renamed yours but buzz extracted it as is and my RC disappeared and became hidden inside your file folder. So the name change was necessary. RC doesnt give any warning when file names are the same. buzz and Fairyy~ I appreciate all of your help. THANK YOU! I've got the tightitembuffer margin set at 15 on mine right now and seems to work well. I feel rightclick is a good program, very handy but you can't accomodate everyone with it. Again, thanks. This is just fantastic! 865 Stars! That's alot of stars Phoon...thanks. welllll knock me down with a feather, he i have been merrily going my way thinking ho hum ho hum, why so few right clicks i want, and now, i have fairys fantastic vienna right click, now 2 or 3 more from you, swamped with riches cheers messiah, i like em.